Our BLT Stacks with Eggplant are an easy to make dinner that cross the classic Eggplant Parmesan with the BLT sandwich. 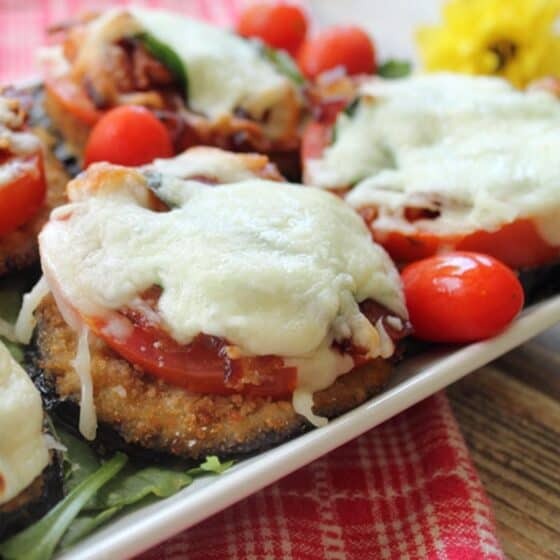 Bacon, tomato & spinach are piled high on a slice of eggplant Parmesan then topped with cheese. And they take less than 30 minutes start to finish. Preheat oven to 400 degrees. Line several large cookie sheets with parchment paper. Purchase a package of frozen Eggplant Parmesan rounds and skip to topping step or follow the 4 steps below for making your own then proceed with topping. To prepare the eggplant, wash then slice into 1/2" slices. Make sure to purchase organic produce so that you can leave the skin on. This ensures that you get the most vitamins and fiber from the vegetable. Place flour, salt & pepper on a flat plate. Mix egg, water and minced garlic in wide-mouthed bowl. On another plate, mix panko, Parmesan cheese, Italian seasoning and lemon zest. Heat a large skillet with a small amount of light extra virgin olive oil. Dredge each slice of eggplant in flour mixture then dip into egg wash followed by another dredging in panko mixture. Immediately add to skillet and cook each side until golden brown. Place on prepared cookie sheet. Top each eggplant slice with 1-1/2 pieces bacon, slice of tomato, spinach leaves and basil then top with shredded mozzarella. Bake in oven for 11-13 minutes or until cheese is melted and stack is heated through. If made ahead of time and refrigerated, bring stack to room temperature then cook as stated above.